Peter Knighton Stocker (D:18 Apr 1988) married Irene May Norfolk (1907-25 Sep 2004) in 1936. They had two sons born in Harston. David was born in 1941 and lived at The Cottage until he moved to No. 5 Royston Road in about 1978 when his aunt became ill. He went to school at Sawston Village College. 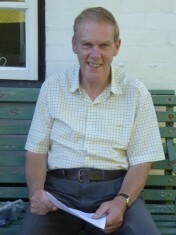 Christopher was born in 1945 and has lived all his life in The Cottage. He went to school at Melbourne Village College. Christopher and David’s parents originally owned land in Hauxton, where they were going to build a bungalow, but war broke out which stopped building and the land was later developed by Pest Control. They moved to Harston in 1941 and bought The Cottage, No. 1 High Street and its garden from Mr W Graham Greene of Harston House. The Cottage was built in Tudor times, and has had later extensions added at each end. It is thought that originally the roof was thatched. It is about 400 years old, and has been refaced here and there. It has low ceiling beams identical to those of the saloon of the old Coach & Horses. It had old peg tiles which have been replaced by modern ones. When Mrs Webster had Harston House, her daughter had pigs roaming everywhere as they weren’t fenced in, including into the Stocker’s land. The pasture land fronting Church St that they later bought had originally had on orchard on it, but the pigs had destroyed most leaving many dead trees that the Stockers had to dig up, creating about 4 acres of pasture. The pigs also dug up the grass tennis court belonging to Harston House. Mrs Webster also had a son who was good at cricket. 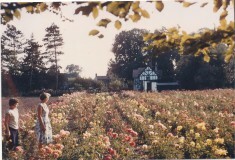 David and Christopher’s mother Irene, ran a rose nursery on the field between the house and the Three Horseshoes pub from about 1956/7 until it closed in 1978. When Christopher left school in 1960 he worked on the Rose Nursery until it closed. He later worked at restoring clocks. 1955 April 22 Lime spreaders, hopper-type, for sale, £150 each, apply Peter Stocker, Harston. There also used to be other buildings backing onto the Harston House walls where the old farm used to be. A concrete standing remains where a large old barn used to be which fell down in the 1960s, once they were no longer able to keep propping up the central beam. A tree that still remains and a brick wall topped by a pantile roof separated the Stockers pasture area from Mary Greene’s wooden (tongue grouve? boarding) studio that had a gable front and corrugated roof. There used to be an open C17th barn that faced the pasture but part of this was later sold to the present Harston House owners (Clarkes) who bricked it in and created an entrance on the Harston House side. Stockers still have part of the building to store equipment in and have restored the brickwork and put new doors in 6 years ago (now 2016), in keeping with the original style. Soon after buying The Cottage, Peter Stocker cleaned out the smaller building nearer the High Street on the left of the house and started a second hand car dealership, which is still going in 2014. 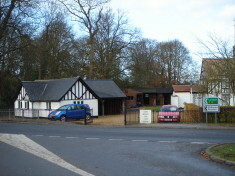 The small building had originally been the village smithy run by Mr Lawrance before he moved to different premises in the High Street between the school and the Pemberton Arms. The bellows etc were still in place in 1941, and when the smithy building was renovated by David in 2008 there were still visible the hand made bricks and finger, hair and butterfly marks. 1945 June 29 Bedfordshire Times & Independent: GM Morris, auctioneer, is instructed by Mr PK Stocker et al., High Street, Harston, who are offering 50 motor cars for sale, including a 1934 Rolls Royce, Austin 7, 10, 18, Hillman 10, 20, Rover 14, Ford V8, Wolseley, Essex Terraplane, Ford 8, 10, Bedford lorries,, vans etc. Sale every Thursday. No 5 Royston Road was bought from the Ayliffs (who had bought from the Rodwells) by Mrs Stocker’s sister, Vera Norfolk, in the late 1950’s (1958?). She opened a haberdashery shop which she called “Vera’s Boutique”. Vera (23 Aug 1904 – 23 Dec 1980) lived at 5 Royston Rd until her death. She had been Deputy Head at Bottisham and taught sewing, which she was very good at. Initially at weekends, then when she retired she ran a haberdashery shop all week, and sold dresses, from the late 1950s- late 1970s using much of the downstairs floor space of No 5 Royston Rd. No 5 Royston Road was originally a Post Office (1840s-1940s) – the area was known locally as Post Office Corner. When No. 5 stopped being the Post Office, it was moved to No. 53 High Street. The Three Horseshoes was the first pub owned by the Greene King Brewery- connected to the Greene’s of Harston House. Sir W Graham Greene established the right of way the Stockers use, exiting by the Three Horseshoes. When the Greene’s owned that pasture field they rented it out to the Thompsons who kept bullocks on it. Thompsons also delivered coal in the early 1950s. 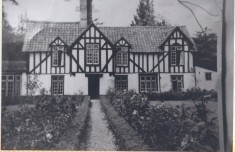 Fountain Cottage was once 4 cottages, with Ms Samuels living in one. Later the Aldis family lived in all of it as one cottage in the 1950s, having re-roofed it. No. 3 Royston Road, Byron’s Lodge, was Badcock’s bakery; this was before David was born (1941). Christopher remembers Dr Cairns, the eye specialist lived there probably in 1960s-80s. In the 1950s the Ling family lived there. No 7 Royston Road was a butcher shop; this was before David was born (1941). The village blacksmith Mr Lawrance lived here, David thinks in the 1940’s. No 9 Royston Rd was occupied by Mr & Mrs Cox in the 1940s & 50s. Mr Northrop lived at No 29 Royston Rd, next to the Deacons. Christopher remembers he worked at the Mill, but in his spare time he did up bicycles in a shed at the side of his house. He was a real expert, and replaced many parts on Christopher’s bike using old parts, charging very little. In 1955 when Christopher was 10 he bought an autocycle (like a modern moped) from Mr Hopkins in Church St (No 37/39). Although Mr Hopkins asked £5 for it, Christopher had only saved up £2, 4 shillings but he let him have it for that amount. Christopher rode it around the pastures around their cottage. Christopher also remembers Harrison’s bakery in Church St in the 1940s & 50s, the shoe repairer who had a small shed on the left side of Green Man Lane, the hardware shop run by Mr Collins to the right of No 29 high St, a gent’s hairdressers in 1957/8 in a little shed to the right of the Coach & Horses and the Pemberton Arms before it had the extension built on the side. He went to Harston School in 1950. Miss Kirkham was a good teacher in 1956, then Mr Frost was his teacher. In 1958 came Mr Vermack who was a teacher of German, South African origins who took over from Mr Shoote, the Headmaster. He was there for 6 months and was very pro-German, saying they should have won the war! Christopher didn’t feel they learnt anything under him and was amazed Mr Shoote let him have his way. This page was added on 28/08/2016.